My brother and I had a great time going after pheasants last weekend. My 12 gauge load is high brass #5 shot and modified choke. It works well when I do my part. We saved up for this trip. When fixed properly, pheasant is delicious. Fun to hunt and good to eat. That can describe a lot of things. Wow..good for you. Looks like nice weather your having. That's great! Nothing like a good walk in the fields with a dog or 2, then the flush! Boy how I enjoy bird hunting! I have a feeling if I went to SD I wouldn't come back! Looks like a GREAT Day..Congratulations. Y'all got REALLY lucky weather-wise to be out there in T-shirts, the 3rd weekend in October...!!!! When I was up that way, this time of year...a foot of snow on the ground, temps. in the 20-30 degree range and a 30 mph wind was an average day. That was OK though...the real bad weather didn't come until January. Good for you two. Can't beat a rising rooster to a dog and gun. 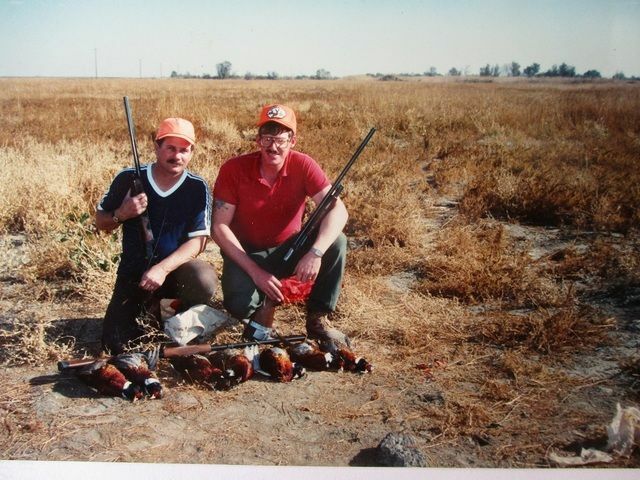 Congrats on a fun hunt, i`ve only gone pheasant hunting once in Iowa and shot one with my sxs 410 Stevens. My neighbors boys just came back fron the Dakota`s and had good success.